HIKE 2: We shopped in Takaka for food before heading for the Kahurangi National Park for another hike. 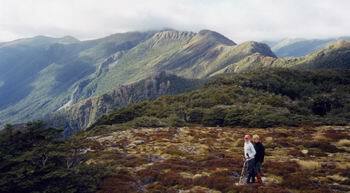 We planned to hike up the Cobb Valley to Fenella Hut and stay one night to get familiar with this area. Day 1: The drive up the Cobb Dam road was very windy and narrow as it followed the Takaka River gorge. We reached a lookout above the Cobb Reservoir and then drove along to Trilobite Hut where we left the car and started hiking. The Cobb Valley is easy walking and the track climbs past two derelict huts. 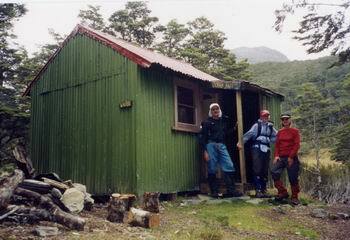 After reaching rustic Cobb Hut we had a short climb to Fenella Hut. 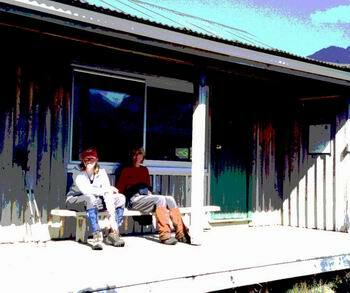 Surrounded by rugged mountains Fenella Hut is an ideal base to explore the surrounding Lake Cobb and above the tree line on Lockett Range and Douglas Range . This time all the hikers were New Zealanders. 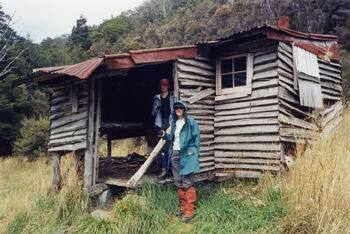 The hut was full (20) and two late arrivals decided to move to Cobb Hut. The floor at Fenella would be better! Again we had a “Pioneer” Stove, and we were hot despite a cold evening outside. Snorers again but fewer and softer this time. 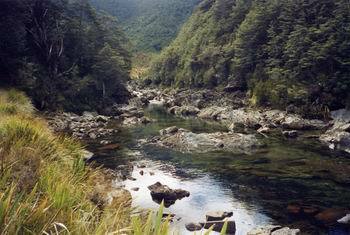 One experienced group was hiking from Takaka, Adelaide Tarn, Lonely Lakes and the Douglas Range. They also intended to traverse the Peel Range. They were carrying lightweight equipment in contrast to many New Zealand hikers who commonly carry huge packs containing everything including the kitchen sink. One man even had a battery powered razor to trim his beard. Day 2: We decided to day walk along the Douglas Range, great views and a good track enabled us to reach the saddle before Kakapo Peak. We reluctantly turned back and descended to Fenella for lunch. We hiked out to our car that afternoon, with the down hill trip taking 3 hours. The views were different and we didn't mind repeating this section. 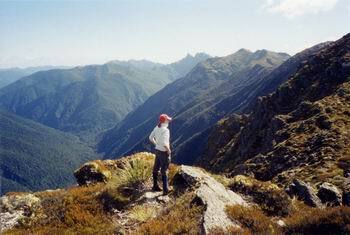 Please do not tell anyone about this hike, it is a NZ secret location, visited each year by a few lucky hikers. If asked, you could say the weather is always awful there or that the scenery is poor and other hikes are preferred. We returned to Nelson, then Marlborough Sound and down the east coast to Christchurch. Two excellent weeks in friendly New Zealand. Thanks to Peter Kemp of Nelson Lakes Shuttles for helping us use our holiday time to best advantage and providing maps and trip advice. 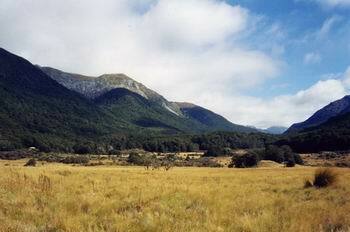 We hope to return soon for more NZ hiking, and hope to see more of the Kahurangi National Park on our next trip.